555 timer IC is a chip comes in 8 pin dip plastic package. Now a days many electronic components manufacturers produce it in large quantity. It is a versatile IC and can be used to build a lot of applications due to which it is very popular among the electronic design engineers, workers, students, hobbyists etc. 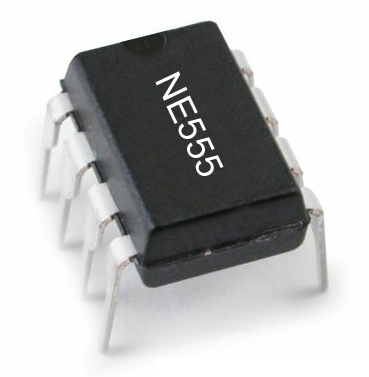 Every 555 timer IC contains around 27 transistors and around 10 to 15 resistors. The IC uses only few external components to form a useful project. The IC can be operated in three modes which are oscillator, timer and one-shot. The IC was introduced 41 years ago and it is still popular after a long time and now its new CMOS version is also available marked 7555 and TLC555. The old 555 was very noisy chip but the CMOS version contains better noise reduction circuitry and lots of other new built in features. Also the new version consume less power in microamperes (uA) due to which it is ideal for battery operated applications. The 7555 can be used as a direct replacement for 555 in most applications.